This aired on Samurai TV but it looks like SEAdLINNNG was focused on the actual in-ring action as I didn’t see any real clipping. So kudos on them for that, I hate when a match is severely clipped and then a promotion airs a 10 minute promo package. As always, you can click on any of the wrestler’s names above to go to their profile here on Joshi City. We start the event with a “High Speed” match, as Natsuki Taiyo is the referee. That means that wrestlers have to go off the ropes before attempting a cover, and generally there is high speed shenanigans (plus Natsuki Taiyo tends to get involved herself at some point). Maruko and Tsukasa are both from Ice Ribbon, Tsukasa is the Ace while Maruko is in her second year of wrestling. On the other side, Tsukushi is also from Ice Ribbon while Mio is a young wrestler from Marvelous. Mio and Maruko start the match, Mio twists on Maruko’s arm but soon they get into the high speed spirit and start bouncing off the ropes. Tsukushi runs in but dropkicks her own partner by accident, Tsukasa comes in too and they trade flash pins. Tsukasa kicks Tsukushi in the chest but Mio kicks Tsukasa from the apron, she comes in the ring but Maruko does too and they both dropkick their opponents. Things settle down with Tsukushi and Maruko in the ring but Maruko tags in Tsukasa, Tsukasa dropkicks Tsukushi and hits a PK. Rolling cover by Tsukasa, but Tsukushi kicks out. Tsukasa tags Maruko and Maruko tosses Tsukushi by her hair, Maruko applies a necklock and clubs Tsukushi in the chest. She tags Tsukasa back in, Tsukasa puts Tsukushi into a crab hold but Tsukushi gets a hand in the ropes. Tsukushi feigns injury but Tsukasa chokes her into the corner, Tsukushi keeps teasing Tsukasa while getting sympathy from Natsuki. Tsukushi finally stops pretending to hit hurt and elbows Tsukasa, Tsukasa chops Tsukushi in the chest but Tsukushi catches her with a dropkick. Mio comes in but Natsuki trips Tsukasa, Maruko comes in too but Mio and Tsukushi double team both of them. Mio armdrags Tsukasa out of the corner but Tsukasa throws Mio and Natsuki into the corner but Mio recovers as Tsukasa charges in. Tsukasa dropkicks Natsuki out of the ring, Tsukasa kicks Mio in the chest and covers Mio, but the referee is nowhere to be found. Tsukasa goes outside the ring to find Natsuki while Maruko elbows Mio in the ring, Maruko slams Mio and covers her, but Tsukushi breaks it up. Maruko elbows Tsukushi but Tsukushi elbows her back and dropkicks Maruko while she is against the ropes. Tsukushi goes up top and hits a missile dropkick, cover by Maruko but Maruko kicks out. Tsukushi tags in Mio, Mio rolls up Maruko but it gets two. Mio hits a headscissors and they trade flash pins, F Crash by Maruko but Tsukushi breaks up the pin by kicking Natsuki. Tsukushi and Tsukasa trade quick pins until Mio breaks that up, Maruko puts Mio and Tsukushi in the corner and throws Natsuki at them, but Natsuki hits a triple jump plancha out of the ring onto Tsukasa. I assume. She quickly returns as Mio hits a diving crossbody onto Maruko, cover by Mio but it gets two. Maruko goes for a spear but Mio rolls through it, Maruko hits the spear on the second try and she picks up the three count! Maruko Nagasaki and Tsukasa Fujimoto win! These high speed matches are always a bit odd but I thought this was pretty fun. All four worked well together and I always enjoy when Natsuki gets involved, she is a bundle of joy. It still isn’t my favorite match style since its not a particularly logical one and it makes the match a bit disjointed, but not a bad way to kick off the event. As I mentioned up top, SEAdLINNNG doesn’t have a large roster (four wrestlers) so they need a lot of outside help to put on full cards. Hiragi is a young wrestler from Ice Ribbon, while both Rin and Takumi wrestle in Marvelous. Marvelous never really makes air but Takumi is one of the best young wrestlers around, hopefully she’ll continue getting more exposure in 2017. 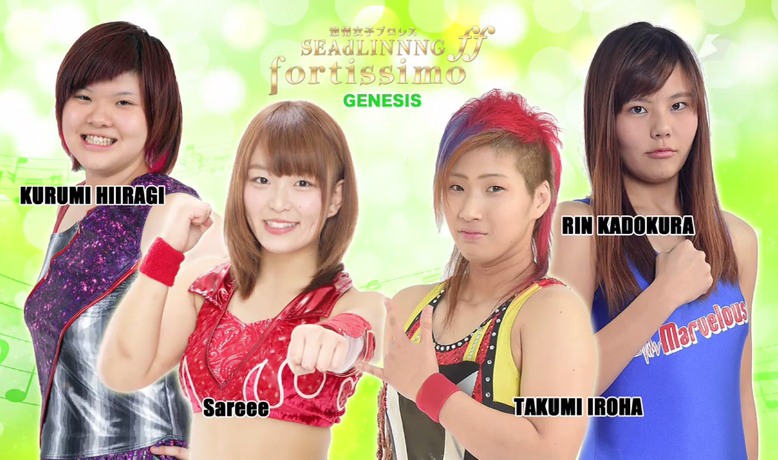 Sareee is the lone SEAdLINNNG wrestler, she signed up with the promotion a few months ago and is also a high quality young wrestler. Lots of talent here, Rin is the least experienced by far but hopefully she will be led well by the other wrestlers in the match. Takumi and Sareee begin the match for their teams, Iroha gets the first advantage when she lands a heel kick and Rin comes in to help, but Sareee dropkicks her and tosses Rin out of the ring. Kurumi comes in but Rin quickly returns and helps Takumi dropkick both of their opponents. Takumi puts Sareee in a headlock but Sareee gets out of it and applies a wristlock. Takumi reverses it and tags in Rin, Rin stomps down Sareee but Rin fires back with elbows and they trade shots. Dropkick by Rin but Sareee hits a scoop slam and puts Rin in a modified Muta Lock. She lets go after a moment and tags in Kurumi, scoop slam by Kurumi and she hits a body press onto Rin’s back. Camel Clutch by Kurumi and she pulls back on Rin’s head with extra vigor, she tags Sareee back in and Rin is double teamed in the corner. Sareee keeps on Rin as they take turns on the young wrestler, Takumi runs in to help and takes out both Sareee and Kurumi. She then picks up Rin and drops her onto Kurumi, but the cover only gets two. Rin goes off the ropes but Kurumi catches her crossbody and throws Rin down, Rin tries again but it gets the same result. A third attempt ends with a backbreaker, Kurumi picks up Rin but Rin hits a trio of dropkicks. Kurumi stays up but a final dropkick sends her to the mat, cover by Rin but it gets two. Rin picks up Kurumi and hits a scoop slam, giving her time to tag in Takumi. Takumi kicks Kurumi before knocking Sareee off the apron, Takumi and Kurumi go at it until Takumi hits a powerslam. Takumi goes up top but Kurumi tosses her off and hits a body avalanche in the corner. Cannonball by Kurumi, and she covers Takumi for a two count. Kurumi picks up Takumi but Takumi slides away and applies a sleeper, Kurumi backs Takumi into the corner to break it up but Takumi gets it re-applied. Kurumi gets a foot on the ropes to get the break, Takumi goes off the ropes but Kurumi catches her with a lariat. She goes off the ropes again but Takumi hits a superkick, both wrestlers crawl to their corners but Sareee is tagged in first and she cuts off Takumi before she can tag Rin. Sareee goes up top and hits a missile dropkick, leg sweep by Takumi and she kicks Sareee in the chest. Takumi kicks Sareee in the chest and hits a superkick, Takumi goes off the ropes but Sareee catches her with a jumping back kick. Rin comes in and dropkicks Sareee, but Sareee hits a footstomp on Takumi before going up top. Diving footstomp by Sareee, Kurumi then hits an assisted senton off the top before Sareee hits one as well. Cover by Sareee, but Rin breaks it up. Sareee picks up Takumi and hits a German suplex hold, but Takumi barely kicks out. Kick to the head by Takumi and she hits a second one, but Kurumi breaks up the cover. Takumi picks up Sareee but Sareee elbows her and the two fire back and forth. Sareee catches Takumi with an Uranage, but Rin comes in and slams Sareee to the mat. Kurumi takes care of Rin but Takumi elbows her before kicking Sareee in the head. Takumi goes up top and hits a Frog Splash, she goes up top again and hits a Swanton Bomb, but Sareee kicks out. Takumi picks up Sareee and goes for the Running Three, but Kurumi runs in and bodyblocks her to the mat. Rin tags herself in as Takumi tumbles into the corner, she slams Kurumi before hitting a missile dropkick onto Sareee. Takumi come sin and drops Sareee with a Liger Bomb, Rin goes off the ropes and goes for a hurricanrana onto Sareee but Sareee blocks it and applies a crab hold. Sareee pulls back onto Rin’s legs with extra leverage, and Rin has no choice but to submit! Sareee and Hiragi Kurumi are the winners. Unlike the last few matches, this one is chock full of very seasoned veterans. Aja Kong and AKINO are two of the top wrestlers from OZ Academy and combined have almost 50 years of wrestling experience, along with multiple title reigns between them. On the other team, Nanae Takahashi is the owner of SEAdLINNNG and has won titles in half a dozen promotions in her long career, while Yuki Miyazaki debuted in 1995 and comes into the match as half of the WAVE Tag Team Champions. So no clear weak link here, as all are very accomplished wrestlers. This one will probably be a bit slower than the last match. AKINO and Yuki are the first two in, armdrag by AKINO but Yuki hits a lariat. Yuki picks up AKINO and catapults her into the mat, Takahashi comes in and they double team AKINO. Takahashi stays in and starts on AKINO’s leg, knees by Takahashi but AKINO kicks her in the back of the head and tags in Kong. Kong chops Takahashi in the corner and kicks her in the back, AKINO returns and she dropkicks Takahashi to the mat. Kong comes back and clubs Takahashi before slamming her to the mat and hitting an elbow drop. Kong clubs on Takahashi but Takahashi elbows her back, AKINO comes in but Takahashi hits a double face crusher on them and tags in Yuki. Yuki lariats AKINO and Kong, AKINO goes to the mat but Kong does not. Yuki distracts Kong with a kiss and finally is able to lariat her over, Kong gets back up but Yuki drops her with a suplex. Yuki goes up top but Kong gets her feet up on the moonsault attempt, lariat by Kong and she tags in AKINO. AKINO goes up top and hits a missile dropkick, AKINO picks up Yuki but Yuki dropkicks her in the head. Yuki goes to pick up AKINO but AKINO knocks her back, Yuki gets AKINO around the waist and suplexes her into the turnbuckles. Yuki goes up top as Takahashi runs in, and with her help she goes for a somersault senton, but AKINO moves. AKINO goes up top, Kong goes to superplex AKINO onto Yuki but Yuki gets out of the way. Samoan Driver by Yuki to AKINO, and she tags Takahashi. Takahashi picks up AKINO and lariats her in the corner, Takahashi suplexes AKINO and hits a lariat. AKINO and Takahashi trade elbows, jawbreaker by AKINO but Yuki knees her from the apron and Takahashi hits a lariat. Backdrop suplex by AKINO to Takahashi, but her cover gets two. Kicks by AKINO but Takahashi kicks her back, AKINO goes for Takahashi’s arm and she applies a cross armbreaker take down. Yuki breaks it up, Kong comes in and she snaps Takahashi’s arm over her shoulder. Takahashi manages to apply a sleeper but Kong drives her back into the corner, lariat by Takahashi but Kong shrugs it off and hits a backdrop suplex. Kong picks up Takahashi and slaps her, Kong charges Takahashi in the corner but Takahashi moves and punches her in the stomach. Lariat by Takahashi, Yuki comes in but Kong lariats both of them. Kong picks up Takahashi, Yuki lariats Kong and Takahashi hits a backdrop suplex for a two count. Yuki goes up top and hits a moonsault onto Kong, then Takahashi goes up and nails the Refrigerator Bomb, but AKINO breaks up the cover. AKINO kicks Takahashi but Yuki runs in to help, sliding kick by Takahashi to Kong but Kong kicks out of the cover. Takahashi picks up Kong but Kong delivers a brainbuster and both wrestlers are down on the mat. Kong gets her paint can but Takahashi punches it out of her hand, slap by Kong and she nails the Uraken for the three count cover! AKINO and Aja Kong win the match. While everything on this show had some type of purpose, business really has picked up with these two colliding. Arisa Nakajima is the former Ace of JWP and one of the best female wrestlers in the world, she recently signed with SEAdLINNNG but wrestles in Ice Ribbon as well. Hiroyo comes into the match holding the OZ Academy Openweight Championship and also as half of the Goddesses of Stardom Championship, like Arisa she is one of the top female wrestlers. 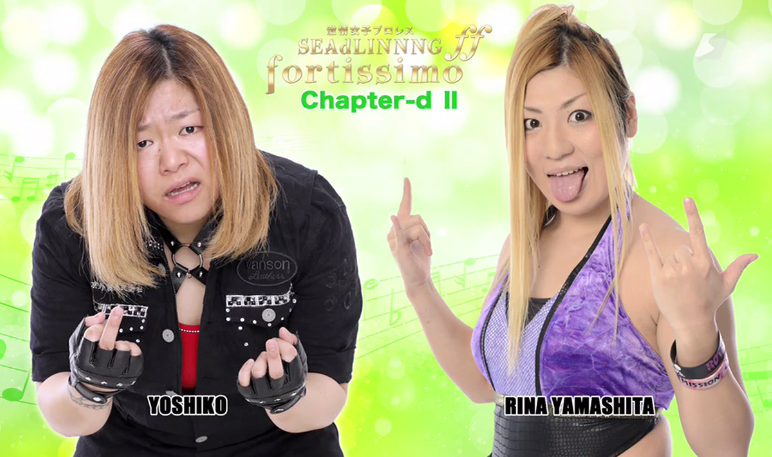 This is their first singles match in almost two years, as Arisa defeated Hiroyo on August 28th, 2015. Nothing tangible on the line here, but Hiroyo and Arisa are not known to hold back so it will be a hard hitting and intense affair. They size each other up before engaging, they trade holds until Hiroyo locks Arisa in a side headlock. Arisa gets out of it and hits a tornado DDT, dropkick into the corner by Arisa and she drops Hiroyo with a release German. Elbows by Arisa, but Hiroyo gets her on her shoulders and chucks Arisa out of the ring down onto Natsuki Taiyo and Tsukasa Fujimoto. Hiroyo goes out after her and throws Arisa into the ring post, she gets Arisa on her shoulders and hits a gutbuster. Hiroyo gets Arisa back into the ring and puts Arisa in the corner across the ropes, body avalanche by Hiroyo and she hits a hard shoulderblock for two. Scoop slam by Hiroyo and she hits a double kneedrop, mounted slaps by Hiroyo but Arisa switches positions with her and slaps Hiroyo back. They trade shots until Hiroyo puts Arisa in a crab hold, but Arisa gets a hand in the ropes for the break. Hiroyo goes up top and hits a missile dropkick, cover by Hiroyo but it gets a two. Hiroyo picks up Arisa but Arisa fights off the suplex attempt, they trade elbows until Arisa hits a Sling Blade. Arisa goes off the ropes and boots Hiroyo in the head, another boot by Arisa and she hits two more. Hiroyo catches one but Arisa hits a double underhook facebuster, Arisa goes up top and she hits a missile dropkick for a two count. Arisa picks up Hiroyo, she flips her to the mat and hits a footstomp. Running boot by Arisa, she slides out to the apron but Hiroyo catches her as she gets back in the ring and hits a release German. Hiroyo picks up Arisa and slams her in front of the corner, she gets on the second turnbuckle but Arisa joins her and the two trade elbows. Arisa knocks Hiroyo into the Tree of Woe but Hiroyo flips herself back to her feet, she re-joins Arisa and tries to suplex her to the floor, but Arisa blocks it and drives Hiroyo face-first into the ring apron. Arisa goes back up top and she dives down onto Hiroyo with a double footstomp, she slides Hiroyo back into the ring and hits another diving footstomp, but Hiroyo barely kicks out of the cover. Arisa goes for a dragon suplex but Hiroyo gets out of it, she goes for a powerbomb but Arisa blocks that as well. Backdrop suplex attempt by Arisa but Hiroyo reverses it and hits a powerbomb. Spinning sit-down powerbomb by Hiroyo, but the pin only gets a two count. Hiroyo hits a body avalanche against the ropes but Arisa snaps off a dragon suplex, elbows by Arisa and she nails a package German hold for a two count. Both wrestlers are slow to get up, backdrop suplex by Hiroyo and she its a sliding lariat, but Arisa rolls through it and applies La Magistral for two. Running boot to the face by Arisa, she picks up Hiroyo and hits the dragon suplex hold, but Hiroyo gets a shoulder up. Arisa goes for the D×D Suplex but Hiroyo blocks it, Arisa goes off the ropes but Hiroyo catches her with a back elbow. Rock Drop by Hiroyo, and she picks up the three count pinfall! Hiroyo Matsumoto wins! The feud between Rina and Yoshiko started last summer, and really picked up steam as we entered 2017. This one is mostly built off of mutual respect, its not a “heated” feud but rather two young wrestlers that think they hit harder than the other. After being on opposing teams a few weeks prior, they decided it was time to have their first singles match to find out once and for all who was the best. A big main event match for both of them, with Yoshiko defending SEAdLINNNG’s reputation against the rising star from Pro Wrestling WAVE. They stare each other down before tying up, Yoshiko gets Rina to the mat first but they end up grabbing each other by the hair as they jockey for position. Yoshiko tosses down Rina by the hair and face washes her in the corner before delivering a running boot to the face. Yoshiko applies a chinlock to Rina but Rina bites her arm to get out of it, Yoshiko goes for a sleeper but Rina quickly gets out of it and knees Yoshiko into the ropes. Headlock by Yoshiko but Rina reverses it, they both try to shoulderblock each other over but neither has any luck. They then start trading elbows until Yoshiko finally shoulderblocks Rina to the mat, but Rina quickly returns the favor and throws Yoshiko into the corner. Rina charges Yoshiko but Yoshiko slides out to the apron, she tries to kick Rina but Rina ducks and they trade lariats with neither going down. Rina finally snaps Yoshiko’s neck on the top rope, sending Yoshiko out to the floor, and Rina goes out after her to hit her with any random objects she can find at ringside. Rina throws Yoshiko into the post but Yoshiko avoids her charge and hits a lariat, Yoshiko gets a running start but Rina rolls out of the way of the senton on the floor. Rina grabs Nanae Takahashi and suplexes her onto Yoshiko, she slides Yoshiko back in and does a cocky cover for a two count. Camel Clutch by Rina, she lets Yoshiko go and puts her in a Scorpion Deathlock. Yoshiko eventually gets into the ropes, Rina puts her on the second rope and delivers a running knee to the back for a two count. Yoshiko comes back with a strike combination and boots Rina in the head, running senton by Yoshiko and she covers Rina for two. Yoshiko applies a choke but Rina quickly gets out of it and jumps on her back with a sleeper hold. Yoshiko gets out of it by dropping to the mat, slamming Rina in the process, she then hits a pair of lariats in the corner but Rina fires back with her own lariats. Another lariat by Rina, she goes for a suplex and eventually is able to get Yoshiko over. Rina gets on the second turnbuckle but Yoshiko joins her, she gets Rina on her shoulders but Rina slides off and hits a powerbomb. Rina gets on the second turnbuckle and hits a diving elbow drop, cover by Rina but it gets two. Rina picks up Yoshiko and hits a backdrop suplex, running senton by Rina and she covers Yoshiko for a two count. Rina picks up Yoshiko but Yoshiko hits a back bodydrop and kicks Rina in the chest. Yoshiko picks up Rina and slams her to the mat, cover by Yoshiko but Rina gets a shoulder up. Yoshiko positions Rina and gets on the second turnbuckle, delivering the diving senton for another two. Yoshiko goes all the way up top the next time but Rina avoids the diving senton, and both wrestlers are down on the mat hurt. Both wrestlers slowly get up and trade lariats, headbutt by Yoshiko but Rina punches her. Yoshiko goes off the ropes but Rina levels her with a lariat, Yoshiko returns with her own lariat and hits a Codebreaker, but Rina fires back with a lariat. Rainmaker by Rina, but Yoshiko barely gets a shoulder up. Rina picks up Yoshiko and goes for a powerbomb, but Yoshiko slides away. Lariats by Rina but Yoshiko stays standing, Yoshiko hits her own lariat and they go back to trading shots. Yoshiko finally wins the lariat battle and knocks Rina off her feet, she picks her back up and delivers a short range lariat but Rina barely kicks out. Yoshiko goes up top and lands on Rina with a diving senton, and she picks up the three count! Yoshiko wins the match! As far as five match shows go, this is about as good as it gets. Everything was at least solid as everyone seemed to be putting in maximum effort, and it helped a lot that nothing was really clipped (maybe a minute or two here and there, but nothing noticeable). The last two matches both delivered, with Arisa vs. Hiroyo being one of the better matches so far this year. 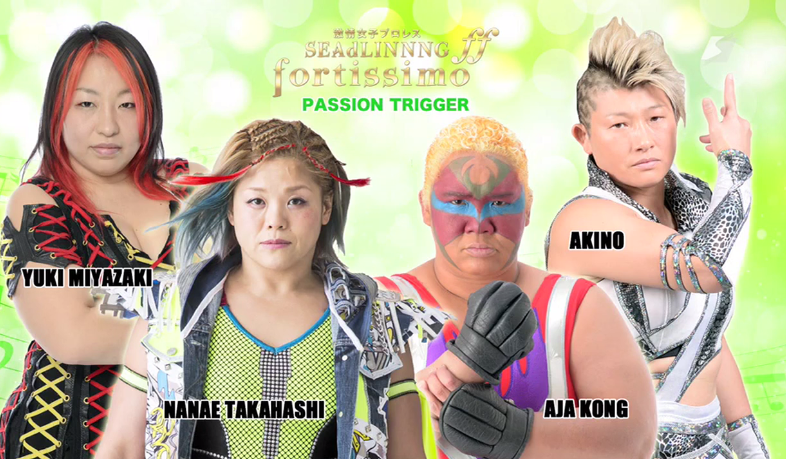 Yoshiko being so heavily featured turns some Western fans off from watching the promotion, but if you do watch one event from SEAdLINNNG this year, make it this one.